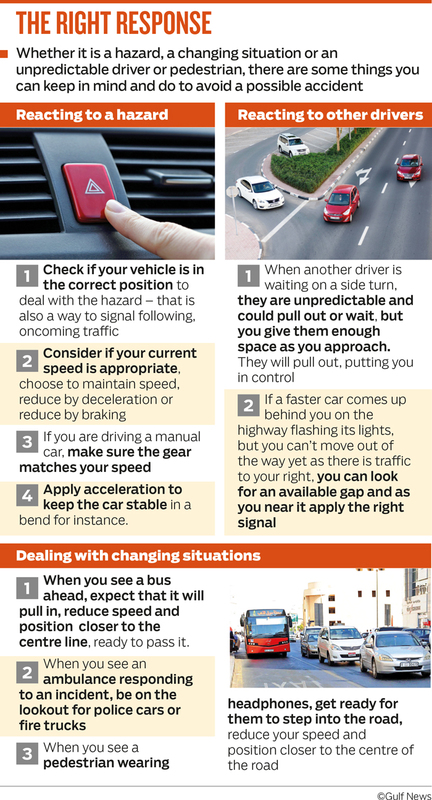 Dubai: Adopting defensive driving techniques will help you stay relaxed on the road, helping you avoid accidents — and high vehicle bills. It is surprisingly simple to follow. All you need to is a bit of practice and focus. “Defensive driving is basically driving in a systematic way, taking, using and giving information to reduce risk, planning effectively and actively managing the behaviour of other road users by your actions,” said Ian Littlefield, Training and EnQHSE Manager, Dubai Driving Centre. As a driver, managing your own behaviour in itself is quite a task, but how do you manage the behaviour of other road users? Littlefield said the key is to create a bubble of safety around your vehicle by giving yourself enough time and space to make your journey safe and relaxed. 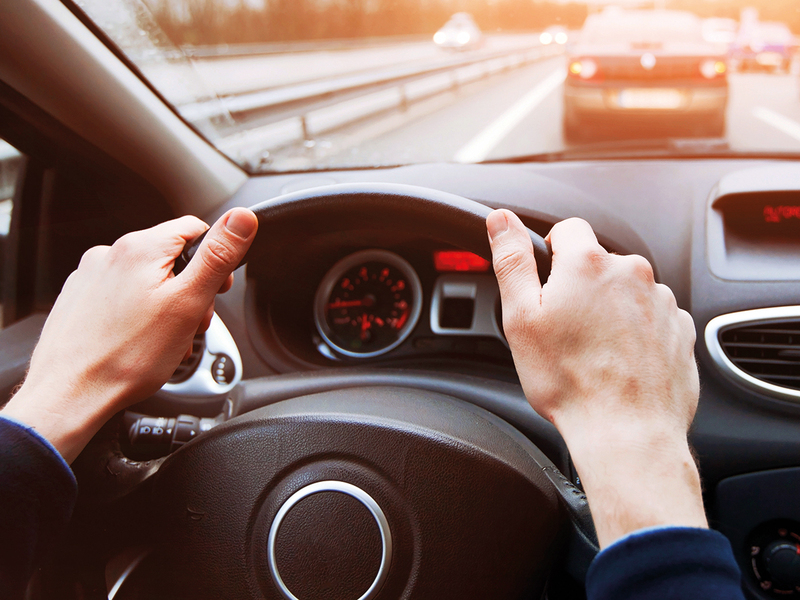 “Controlling your speed to give you enough time to act safely and smoothly on the information you are taking in will help you create a bubble of space around the vehicle. When someone squeezes your bubble from the back, you extend it in front and you try to do the same with your side space. It might sound complicated but in reality with a little bit of practice it becomes second nature,” added Littlefield. Once a driver adopts defensive techniques, he is more relaxed, gets involved in fewer incidents and saves money on vehicle-related bills. “Defensive driving is about having an approach that leaves nothing to chance. It promotes careful observation, early anticipation and a methodical use of vehicle controls aimed at maximising stability,” Littlefield explained. The ‘System of Vehicle Control’, developed by Sir Malcolm Campbell and the UK Metropolitan Police in the 1950s, is now in use with emergency services around the world. The method is also referred to as ‘Advanced Driving’. As much as it is about a set of techniques, it is also about developing a positive frame of mind. Referring to a research study, Khalid Javed, Training and Technical Consultant, Emirates Driving Institute (EDI), said that 96 per cent of road accidents are caused by human errors, which can be avoided by driving with a positive frame of mind and driving defensively. “The physiology of defensive driving method encourages the road users to control their anger and show courtesy towards other road users,” said Javed. He added that the methodology helps the road users to keep their vehicle in a safe position at all times, while always keeping an escape route open to compensate the mistakes of other drivers. “The idea is that every action is part of a plan, not just a random act or a knee-jerk reaction and so our progress will be smooth — safe, unhurried and relaxed. Defensive drivers are also courteous and considerate of others, but they use these traits to control how other drivers behave,” said Littlefield. That might sound a bit complicated, but it is something that anyone can do with a bit of practice, added Littlefield. Most Dubai driving schools, including EDI and DDC, run specialised courses on defensive driving, which could come in handy to improve road safety. Taking Information: By scanning the road and mirrors, by listening for hazards such as emergency vehicles and fast cars and feeling the feedback from your car through the wheels and steering. you can even use your sense of smell for instance to detect a diesel spill or vehicle fire. Using Information: Once you have gathered all the available information, you use it to plan what you will do about what you have seen, heard, felt and smelt. Giving Information: Once you have a plan you need to let people know your intentions so that they in turn can alter their plan. This can be done by using timely signals, by using other lights, brakes or flashing headlights and through the position of your vehicle. Whether it is a hazard, a changing situation or an unpredictable driver or pedestrian, there are some things you can keep in mind and do to avoid a possible accident. 1. If you see a developing hazard, you check if your vehicle is in the correct position to deal with the hazard — remember that position is also a way to signal to following and oncoming traffic that may not have factored what you have. 2. Consider if your current speed is appropriate for dealing with the identified hazard and choose to maintain speed, reduce by deceleration or reduce by braking. 3. If you are driving a manual car, make sure that the gear you are in matches your speed. Look for a gear that will give you equal ability to accelerate or decelerate as necessary. 4. Finally, apply acceleration, this does not always mean going faster, it may simply mean maintaining some acceleration to keep the car stable in a bend for instance. 1. When another driver is waiting on a side turn, they are unpredictable and could pull out or wait, but you give them enough space as you approach. They will definitely pull out, putting you in control of the situation. a. It reduces frustration in the following driver by letting him know you are going to move over. b. It prevents them from making a potentially dangerous undertaking manoeuvre. 1. When you see a bus ahead, expect that it will pull in, reduce speed and position slightly closer to the centre line, ready to pass it. 2. When you see an ambulance responding to an incident, you should now be on the lookout for police cars or fire trucks that may be doing the same. 3. When you see a pedestrian wearing headphones near the edge of the pavement, get ready for them to step into the road without hearing your approach — reduce your speed and position closer to the centre of the road.